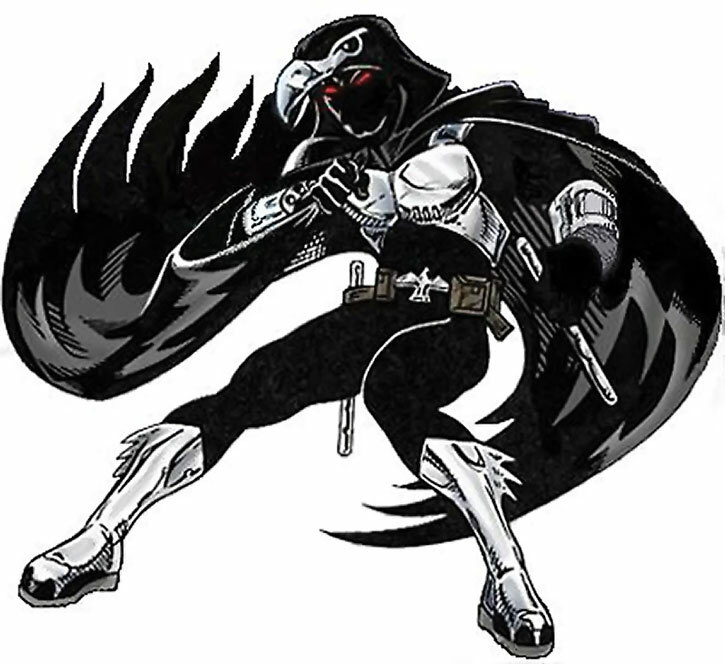 I was after Nighthawk info to learn more about him, and was wondering if there's more heroes/villains with a bird theme. @bulgarex could you help me out once again? There are a few heroes with a "bird" theme who have been fully written up for the current official setting, in terms of detailed history, personality, appearance, and full PnP game stats. The other active ones I can think of offhand are Autour ("goshawk"), a hero of France using a winged technological battlesuit; Harrier of Australia, who wears a somewhat similar flight suit confiscated from ARGENT; Silverwing, a mutant with energy powers who protects Singapore; and Soaring Eagle, a telekinetic who's a prominent champion of South Korea. All of these are detailed in Champions Worldwide. Champions Universe does mention and briefly describe a few others, though. 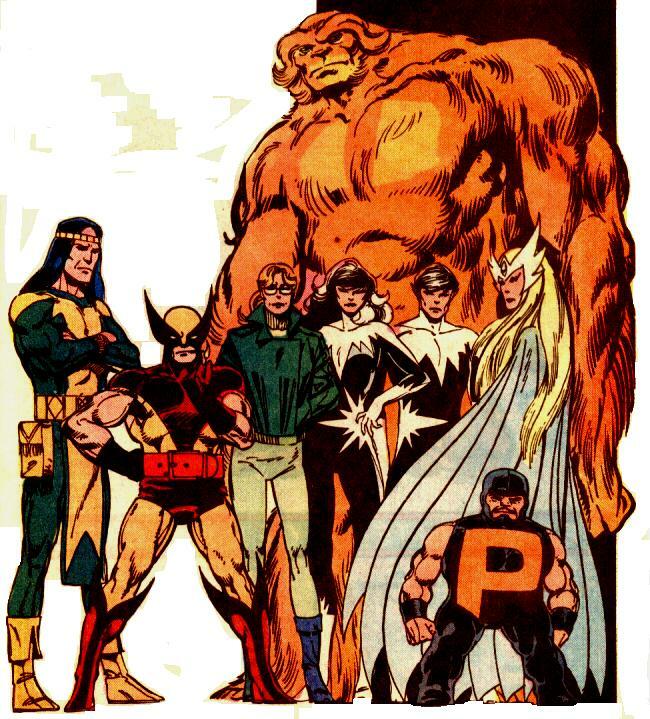 In America there's Sparrowhawk, described as "a teenaged mutant with wings," a member of Houston's Hero Corps team; Condor, a flying "brick" and leader of San Francisco's Freedom Patrol; and FalconMan, flying hero from Washington who serves in the Capital Patrol. Internationally CU also mentions Swift Swallow, a flying speedster who's part of the London Watch. CV Vol. 3 stats out Harpy, who uses an alchemical formula to become a powerful bird-woman. Still on the mystical front, enchantments were used to turn a normal human couple into the bestial eagle/lion/man hybrid called the Gryphon; and the winged Lady Crow, who can mentally control flocks of birds, and even see through their eyes. Both are described in the adventure book, Shades Of Black. DEMON: Servants Of Darkness also mentions that after the events of SOB, the pair came to serve a Morbane of DEMON. Those are just the presently active supers, though. A few others from past eras have retired or died. Probably the most prominent of those included Der Sturmvogel ("the storm bird'), the first superhuman of the modern era, who fought for Germany during WW II; and on the Allied side, Princess Mara of Atlantis (now Queen Mara), a founding member of the Defenders of Justice, who used the code-name, the Sea Hawk. Another well-known hero was Princess Klee of Thaar, island home of the Birdpeople, who for much of the 1970's belonged to the legendary hero team, the Fabulous Five, fighting under the name Kestrel. Another Birdperson betrayed his people and became the villain Gyrfalcon (although he's never been written up). There's a lot of them, I'll read more about it to pick up some ideas for a potencial bird-themed hero. Now about Nighthawk, any info you can share? What books should I look? 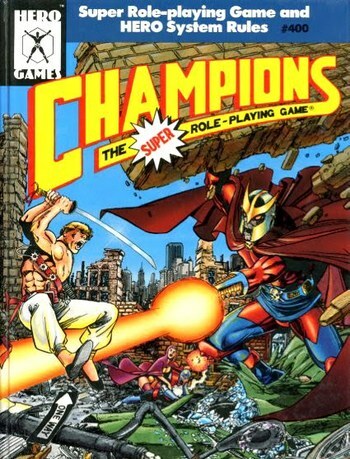 Nighthawk's original write-up appeared in the Champions "genre book," comprising guidelines and examples for using the Hero System rules (published separately) to run superhero games. That is, the genre book for the Fifth Edition of the game -- it was updated for Sixth Edition, but without Nighthawk. However, his biography and character sheet were updated with several years of experience in Champions Universe: News Of The World. He hasn't been reprinted to date in any Sixth Edition book. Mark Whitaker was a brilliant young computer science student and star athlete, who attempted to intervene in a VIPER raid on his college's computer science department to steal valuable components. Mark was caught in the explosion of a grenade which scarred his face. The incident also left him with an obsession to combat such injustice, especially by VIPER. (IMO the change in his personality was so radical, I suspect brain damage from the explosion; but that's not official.) Mark trained himself relentlessly in crime-fighting disciplines, built some gadgets to help him, and two years later hit the streets as Nighthawk. Realizing he couldn't take on many supervillains by himself, he joined Defender's nascent Champions team. In 2006 Nighthawk went undercover to infiltrate the Alliance, a small army of villains being built by the master villain Holocaust (Champions Villains Vol. 1). To maintain his cover he had to fake his own death as Nighthawk, hiding the truth even from the other Champions. With the aid of the Champions he ultimately broke up the Alliance, but his team mates felt betrayed by his deception, and Nighthawk and Defender actually came to blows, leading Nighthawk to leave the team. The current status of Project Mongoose is unclear. It's barely mentioned in 6E books. Signal Ghost's entry in Champions Villains Vol. 3 notes that she helps them on occasion, but has mostly returned to theft. Meanwhile Nighthawk has patched things up with the Champions enough to help them out with investigations from time to time. And that's where Nighthawk's appearances in CO pick up. In a straight martial-arts fight, probably. Both the beginner and veteran Hero System write-ups for Seeker put more emphasis on his martial-arts skills. Nighthawk is also a detective and gadgeteer. However, if Nighthawk had access to his gadgets that could make a significant difference in how a fight would play out. And the popular pejorative nickname for Nighthawk is "Nightduck," based on how his cowl was initially drawn. Australian martial artist who was used a lot in cover art in 4th edition, and then mostly faded (I think Steve Long didn't like the character). Seeker was a member of the previous incarnation of the official Champions hero team -- an orphaned Australian swashbuckling martial artist trained in ninjutsu by an Outback survivor of a WW II Japanese ninja recon team. Yeah, I know. But it was 1989, and Aussies and ninjas were both big in pop culture in America at the time. Fun trivia: on Champions Earth, there's a licensed comic book based on the Champions team, but Nighthawk (who was a member at the time) didn't sign off on the use of his image. So the publishers created Seeker to fill his spot. Is that the cannon reason for the Powerpuff Champions pic with Seeker and Quantum in it? Nah, that pic was just a cute bit of fan service for veteran Champions players.